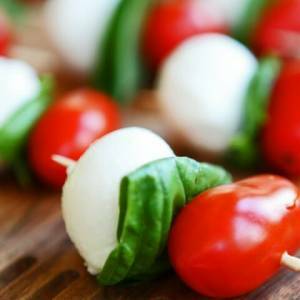 Place a tomato, basil leaf, and mozzarella ball on each toothpick. Place on a serving plate or tray. Whisk together the olive oil, vinegar, and garlic and drizzle over the appetizers. Sprinkle with kosher salt and freshly ground black pepper. To eat, bite everything off the toothpick all at once.